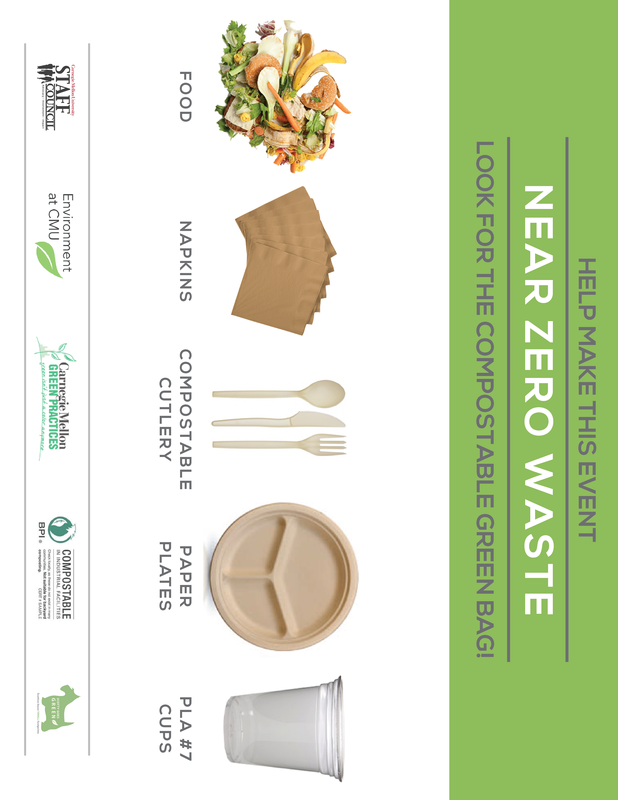 *A zero waste event means that 90% of the waste can be composted or recycled at the end of the event. What to order from catering for a 'near' zero waste lunch event. A zero waste style buffet lunch for a larger group, ordered through our campus caterer, Chartwells, can be good choice, as they offer a variety of delicious lunch buffets. Or try a more traditional lunch of fruit and pasta salad, sandwiches & cookies on platters. Work with catering to get creative with the food menu options and ask for their advise. The price is comparable to the cost of a box lunch. 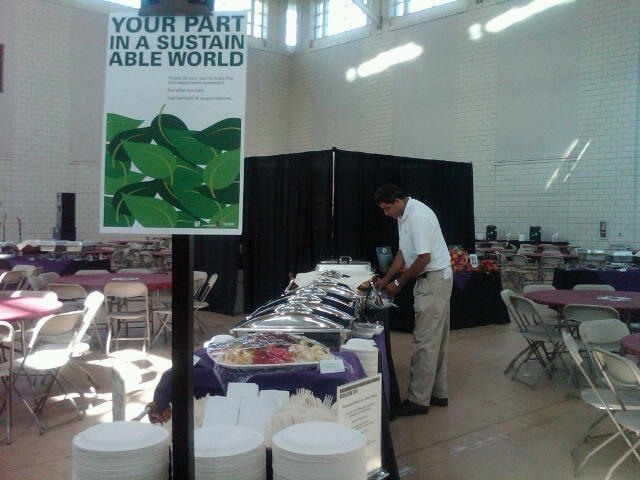 Chartwells offeres compostable serviceware for no added cost. Request Chinet paper plates, compostable utensils, #7 compostable cups and request drinks be provided in bulk dispensers. A couple of tricks to making a box lunch ‘near’ zero waste. -Ask for healthy options which will provide guests with carrots and whole fruit in lieu of chips, as well as a wrap or sandwich with no plastic packaging. -You can ask for the drinks by the gallon, in pitchers or dispensers which will do away with water bottles & soda cans, they can do juices, ice tea, lemonade, water, etc. in this fashion. -You can ask for the cookies to be provided on a platter if you want them to have something sweet post meal or if you want salty snacks, they can provide you with bowls of chips and pretzels for a pretty minimal cost. -Finally, make sure they use PAPER boxes which can be recycled, INSTEAD of the plastic clamshells. How does the compost get picked up from my event and composted? 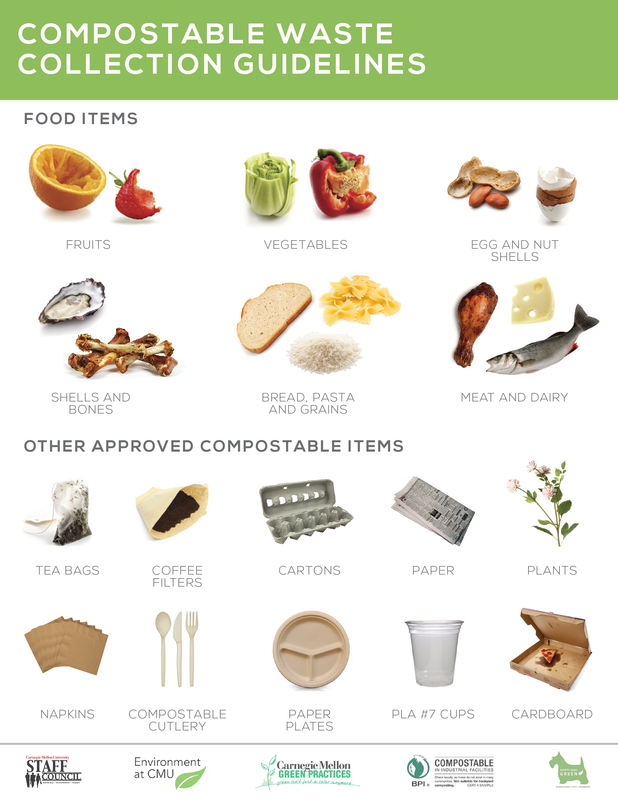 It depends on where the event is taking place on campus, in the University Center, you would include in your set-up instructions that it is a 'green' event and needs to be set up for food composting. In your department, you will need to set up the event yourself, and generate a FMS work order by calling 268-2910 for Custodial Services to pick up the compost bags after the event is over. For more information on how you can plan a green event; contact Barb Kviz; bk11@andrew.cmu.edu or call 412-268-7858. When you place the order tell them it is a 'green event' and you want to minimize using plastic and polystyrene foam.